I’m a fan of ink. The cartridge-in-pen kind, not the kind you pay to have an “artist” carve into your skin. Back in my day (and you know you are getting’ up there when you start using that phrase), tattoos were a sweetheart-on-your-bicep art form sported by sailors and inflicted in a parlor (not the one reserved for the parson’s Sunday visit either). But today tats are everywhere you care to look (and some you don’t). Rappers have tattoos. College kids are inked up. And the fierce female on the elliptical machine next to me at the gym has branded her thighs EMPOWERED. But then I was sent a package of temporary tattoos from a company called Armed with Truth, and I had a problem. They happened to be Scripture verses, and I love Scripture. I do not throw away Scripture. I’ve even been known to scribble a Bible reference or two on my arms for quick recall. Beloved Christian author Ann Voskamp inks a small cross on her wrist almost every day to remind her of the cruciform life. But what is a 60-something grandma going to do with a whole pack of tats, temp or not, even if they are the Bible-quotin’ kind? And then my young friend Sarah helped me out. She came by late one night last week to talk through some life issues with Mike and me. She loves us and we love her – no judgment there. And there’s something we share, at least her and me – the Chicken Little tendency to catastrophize. To let fear grip us by the throat. To pour anxiety through our veins. As she was leaving, I showed Sarah the pack of temporary tattoos lying on my counter. Her eyes lit up. “I’ll take one of these,” she said. “Take two!” I urged. 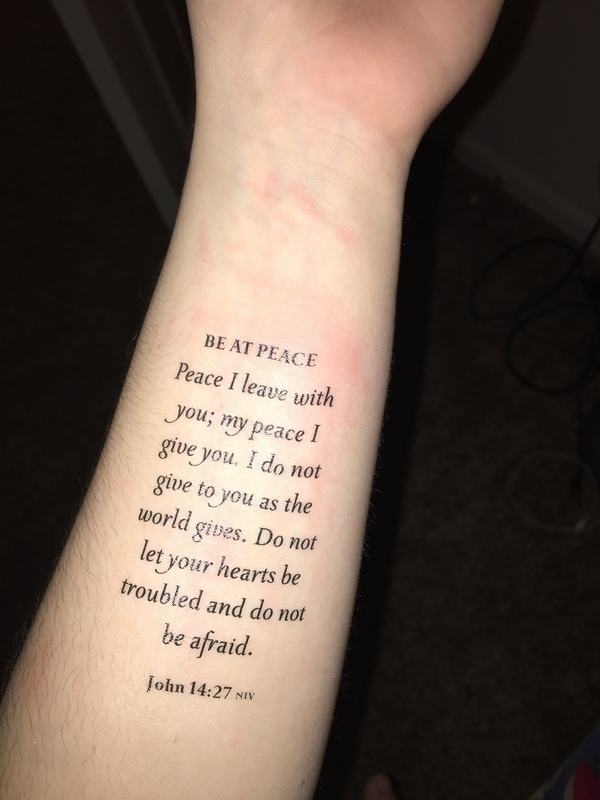 So on Sunday morning after church I gave Sarah the entire pack, and she has become a Scripture Tattoo evangelist even among her adult friends. So, yeah, sharing your faith and your hope and your love happens in lots of different ways. 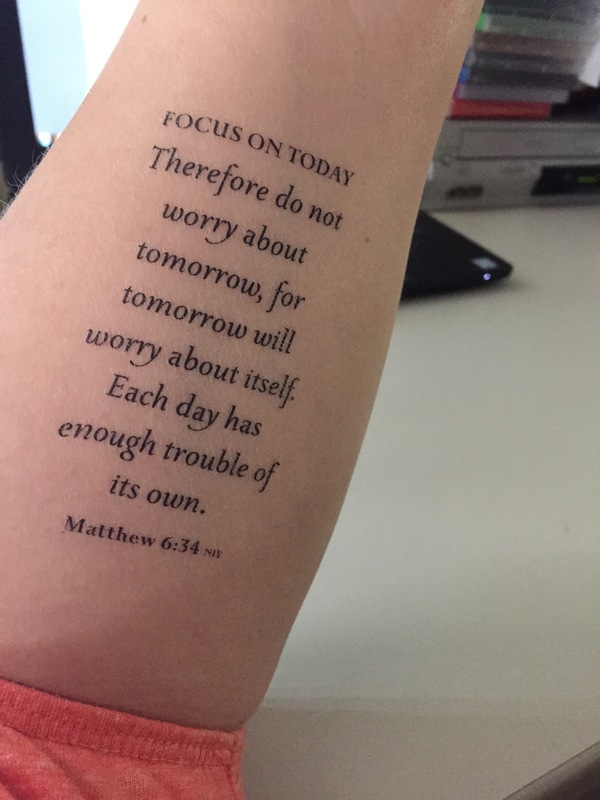 Interested in winning a free pack of scriptures for your own Tattoo Evangelism? The Armed with Truth folks are sponsoring a giveaway. And if you’d like 20% off on your order, use the code maggierowe. Ha! I’ve become a Tattoo Evangelist myself. Interesting, Maggie. A new way to evangelize!! God always finds unique ways to share His love and His Word. That is awesome! A tattoo evangelist! How shocking! 😀 But what fun to see how God uses everything to share his love,. Love this, Maggie! Way to show us how to live outside our self-made boundaries.